There are all kinds of connectors in the surveillance world; from audio to video, it can get confusing at times. So to help sort things out we will go over basic information about common types of cctv connectors both new and old and give examples of how they're used in other media devices as well. The BNC adapter is the most common type of connector used for video in the surveillance world. This connector is used for connecting video cables to various equipment such as security cameras, DVRs, and monitors. In surveillance BNC connectors are usually connected to an RG59 cable which is used to transmit the video signal. The three most common types of BNC connection methods when attaching the connector to a cable is twist on, compression, and crimp on. Of these three, compression and crimp on will offer the most stable and secure connection, whereas over time a twist on connection is more apt to fail. Additionally it should be noted that in surveillance systems this type of connection is slowly starting to be replaced with RJ45 connectors. This is due to the slow increase and eventual takeover of HD and IP security cameras that use a digital rather than an analog signal. Other examples of where BNC connectors can be found are in multimedia applications such as radio and television. A good example would be that of a field monitor used in television or film recording. The RCA connector has multiple uses, but in the surveillance world it is mainly used for audio. There are some older security cameras and simple consumer options that use RCA for their video, but in general BNC provides a more stable and secure connection. So for audio inputs or microphone attachments in a surveillance system, you will most likely be dealing with an RCA connector. A good example of RCA connectors can be found when hooking up a DVD player, a video game console, or other multimedia devices. In general they will come in a pair of three and be colored red, white, and yellow. Yellow is usually the video connector while white and red are the audio connectors. Although this connector still tends to be used rather strongly for audio in the surveillance world, it is slowly be replaced by HDMI connectors in home media with the rise of HD content. A VGA connector is a standard connector that is used when connecting a DVR to a monitor. This connector is slowly being phased out by HDMI as well, especially as HD cameras and DVRs become more viable and common. VGA cables are also the waning connection method used for computers when connecting to a monitor, but they're making the switch to HDMI and DVI connectors quite rapidly. Right now HDMI connectors are all the rage. These connectors make HD content as well as audio on one cable possible. This is the type of connection you will see on newer HD DVRs for connecting to a monitor. For a visual reference an HDMI connector looks like a slightly thinner and longer USB connector. If you happen to have a blue ray player, then most likely this is the type of connector you are using. USB connectors are the standard accessory connector that is used for PC and DVR paraphernalia such as keyboards, mice, and digital cameras. These connectors are used in surveillance mainly for DVR accessories, but in the world of computers they can be used for all kinds of electronics that have the ability to interface with a computer. 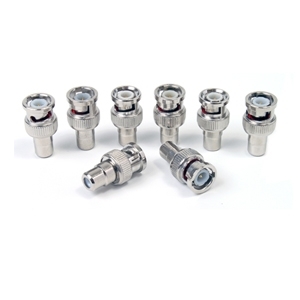 Coaxial connectors are a screw together type of connector, and they are a thing of the past when it comes to surveillance equipment. At one time they were the main connection method before the advent of BNC connectors, and they were also used on the same type of cabling, but they weren't as convenient to use; so they were phased out. Coaxial connections are still massively used in the world of broadcast as they are the cable connector that comes into any home that has cable television. An RJ45 connector is one that many people are most likely quite familiar with, but may not know it. These connectors are the main type of connectors used in networking and IT systems. If you have ever connected your computer to a router with a cable, it is quite likely that this is the type of connector you used. This connector looks like a larger version of a land line phone connector. In the cctv surveillance world the RJ45 connector has slowly begun to phase out the use of BNC connectors. The reason for this is their ability to handle HD video, network communication, and audio all on the same cable. This is extremely important as it accommodates the many new functions of security cameras, such as IP networking, HD video quality, and PTZ functionality.